Apply the principles of the AMA Guides with this must-have companion book. More than 70 in-depth cases cover an array of different systems and diagnoses, mirroring the chapter organization of the main Guides editions to promote ease of use. New to impairment evaluation? This practical resource provides excellent instruction to help you quickly assimilate to the Guides Sixth and learn how to correctly apply its principles. Experienced evaluator? Refine your skills by comparing your understanding with that of the authors—all experts in the field of impairment evaluation. 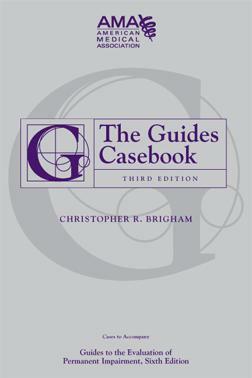 This book will also prove helpful to professionals studying for examinations in the domain of impairment assessment and to other professionals, such as attorneys, claims professionals, nurses and case managers who read reports and need to know how ratings should be performed.